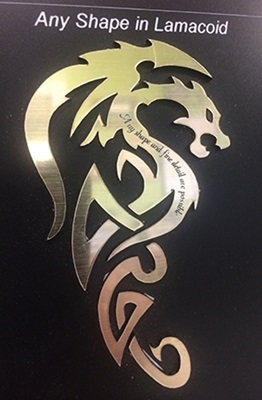 Lamacoid is a general term used to describe the 2-ply plastic which we laser engrave to burn away the surface color to reveal the alternate core color. 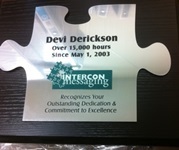 Very fine detail is possible to make award plates, name tags, legend plates, valve tags, etc. It is also very cost effective and comes in a wide variety of colors and textures that can be cut in any shape or size. 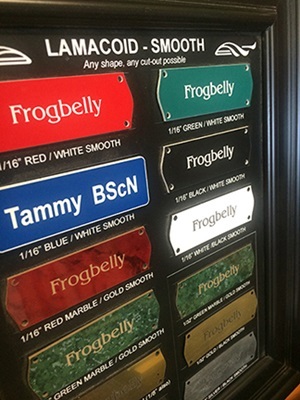 They can be made in a short time and are easily mounted with adhesive backing, cable ties, nails, magnets, etc.